The Hate U Give: Algee Smith and Amandla Stenberg just before he moment that forever changed their lives. This week, I’m playing catch-up with a string of recent and new releases that didn’t make deadline. It’s any portmanteau in a storm when Joel and Ethan Coen avail their services to Netflix for this six-part Western anthology. It’s okay to open by plagiarizing John Ford’s location of choice, Monument Valley, but even Pappy couldn’t convincingly insert a studio cutaway and make ‘em mesh. The brothers were wise to first get the worst out of the way: the opening segment, from which the film takes its title, finds Tim Blake Nelson pitching his good-natured cowboy sociopath as a cross between shaky-gun Don Knotts and Tom Berenger’s rhapsodic rustler. Why saddle their lead character with a name that wouldn’t be coined for at least a decade? (‘Twas Keaton who gave rise to the name.) With his ten-gallon pulled low so that the tips of his ears bow, Scruggs is one of the most annoying characters to come down the Pike since Roger Rabbit. The rest of the bits vary in quality, save for one standout: Tom Waits’ precise prospector could have sprung from the mind of Rod Serling. An African-American student from a working class neighborhood attends a predominantly all-white high school on the other side of the tracks. Starr (Amandla Stenberg) skillfully walks the tightrope between black and white culture until the day a routine traffic stop forces her to make a life-altering decision. Routine, that is, if you’re a white cop looking for some black kids to hassle. It ends with her best friend dead on the pavement, the victim of a trigger-happy officer’s bullet. Not the filmed lesson plan that I feared going in. Yes, it’s a good ten minutes too long and the climax (a loose gun falls in the hands of a toddler) follows in the footsteps of too many movies and television shows by insisting that the life of a child is more important than that of an adult. Still: if the film manages to transcend most of the cliches, we have Stenberg’s finely etched lead performance to thank. George Tillman Jr. directs. A hard-working family of five looks to shoplifting as a means of supplementing their paltry income. Upon returning home from a hard day’s pilfering, father and son “lift” the little girl they find rummaging through the trash outside their door. The idea was to feed her and send her packing to her parents. That all changes when granny discovers bruises and burn marks on the child’s body, whereupon she basically becomes part of the family. What will happen when the cops find out? Will they nail the negligent parents for their child’s disappearance? Or will the dynastic looters — these are, after all, well-intentioned petty thieves, not kidnappers — be held responsible? 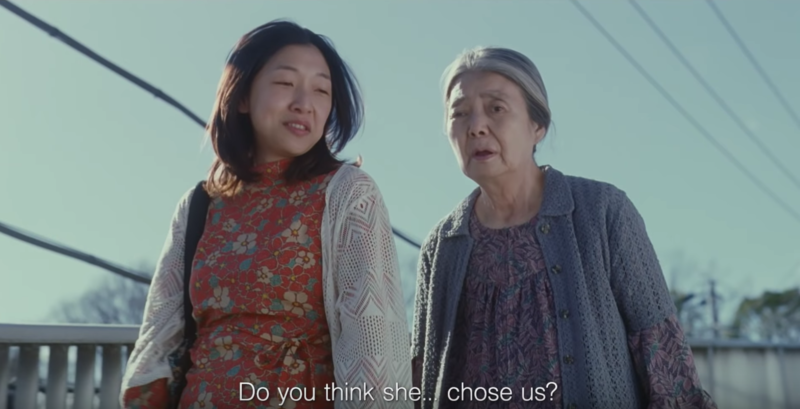 Hirokazu Kore-eda positions his resilient family in their cramped surroundings in a manner reminiscent of the moments of intimacy Vincente Minnelli afforded each member of the Smith family in Meet Me In St. Louis. Shoplifters was just this week given a stay of streaming execution at the Digital Gym. After that, it’s VOD.